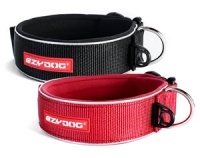 The Neo collar from EzyDog is secure, comfortable and suitable for all your dog's adventures. 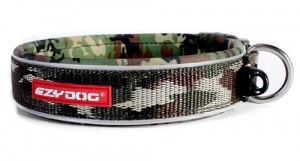 The neoprene construction makes it weather and waterproof, sporty and super durable. 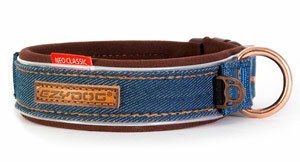 This thick and chunky dog collar is incredibly sturdy and can withstand all your dog throws at it. Neoprene is easy to clean, quick to dry and waterproof. 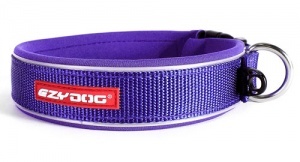 The Neo collar is so named because it is made of neoprene (as used in wetsuits) which has been reinforced with soft touch nylon webbing for extra strength and durability. The edges are rolled, giving a soft comfortable finish against your dog's neck. 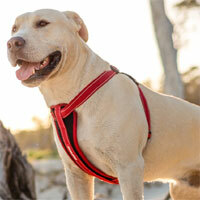 Neoprene is waterproof, easy to clean, quick drying and non-porous so it won't absorb oils and this drastically reduces the odour that traditional collars retain. The colours are bright and vibrant. 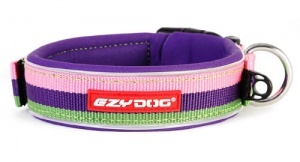 A great extra touch is the reflective piping around the top and bottom edge of these collars, for low light safety. 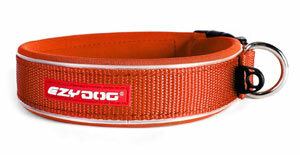 Due to the depth of the neoprene, if your dog’s neck measures close to the top of the measurement we recommend that you purchase the next size up. Please see "fits neck approx" guide in the table below. 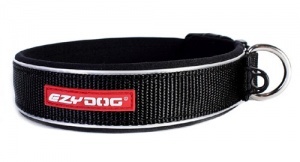 This quick-dry neoprene dog collar offers the best in comfort, style and durability. Go play! 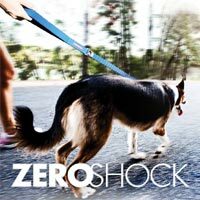 only reason I do not give it 5 start is I do feel it is a little cumbersome and I often remove our dogs ones at night, but then being so super and sturdy is great so I rather counteract myself. Lovely collar has being washed and still held colour yet harness has being big disappointment and need new one still think prices are a lot and think will fade considering should be more durable to English weather and mud and a lot of money when doesn't last the best product is the lead . We are sorry to hear this. 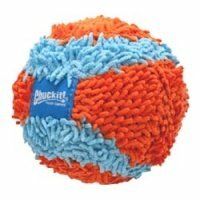 Could you please email us with your details and we will replace the item for you. I ordered the medium as my 2 dogs necks measure 16.5 inches. 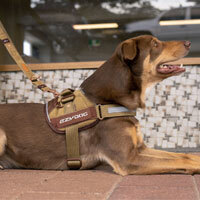 They arrived the next day but were to small and the velcro adjustment only just made contact. I contacted DforDog who swiftly sent the returns email. I paid the extra for the large collars and posted the mediums back to DforDog on the Monday, I got the large collars on the Wednesday. FANTASTIC SERVICE. 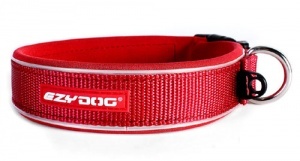 The collars are very strong and soft on their necks, and makes it much easier to handle them on the lead with the collars being wider, also reflective for the dark nights/mornings. I would size up if you are near the upper end of the sizing chart. We have recently taken on a rescue collie. 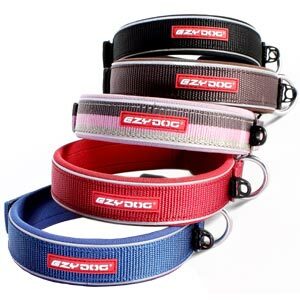 I have never had a dog before and spent a while online trying to find a decent collar to replace the horrible nylon one she arrived with. This Ezy Dog one immediately caught my eye as head and shoulders above the nonsense collars that are on the market (bow ties ? really ?!). Ordered straightaway. Have been really impressed. 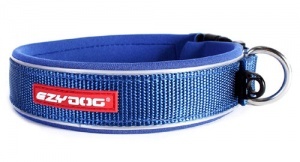 It is light, it looks comfortable for the dog as does not dig in if she pulls slightly on the lead or if you have to hold the collar. And, as a bonus if you are a proud owner, it looks great ! Difficult to understand why other reviewers are quibbling about price for something that your dog can wear in comfort for 365 days a year. 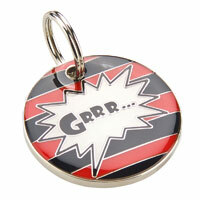 Every dog deserves one of these. 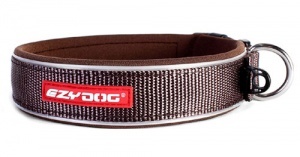 Unbelievably strong buckle, quick drying, easy to clean, and the boys seem to find them comfortable. So good we've just bought another two as extras/spares for when the others need a wash.